‘You cant have too many Leica lenses Santa’ – I explained, he just groaned and said ‘can you just get off my knee, you are waaay to heavy’ – I was thrown out of the grotto. Persistence pays off however as he delivered down the chimney a new 35mm Summilux F1.4 – the all time classic reportage lens. My trusty 35mm lens for the past 25 years has been the F2 Summicron, a design which has barely been changed and I thought was beyond improvement (great colours, sharp corner to corner at all aperture etc) but even a quick glance at the back of the camera to review the files showed the new lens in a completely different light. With its modern lens coatings and floating lens elements the images have a new level of clarity and ‘pop’ to them. F1.4 is fantastic to shoot in low light that extra f-stop makes all the difference and provides that very attractive shallow depth of field. This lens is considered to be the finest 35mm lens ever made and its easy to see why. OK this post is about an insane lens, insane in more ways than just its huge cost of nearly £8K. This is a lot of money for small amounts of glass and brass, so how can it possibly justify the hefty price tag? Perhaps its neutron star density? Well, like the volume control in Spinal Tap, this lens goes all the way up to ’11’. In photographic terms its top setting is f0.95, making it the fastest production lens yet made by man. Its light gathering abilities are better than the human eye, which means there isn’t a shoot yet devised that requires available light that cannot be tackled by this lens. It doesn’t end there. This lens renders images that border on the magical, with sharpness even at its top setting as good as many other lenses at more sober apertures, yet still producing superb colours and contrast. The image above was taken in very low light and is pin sharp. The expense is down to a meticulous, hand-crafted manufacturing process. Each lens is repeatedly checked by technicians during production, to ensure the highest possible quality of image. It has long been considered the holy grail of all lenses, so where does this leave my clients? As recently demonstrated to corporate clients, I use it at for events or conferences where I need discreet but comprehensive coverage using available light only. It’s also fantastic in board room situations where I can use the lens’s incredible razor thin depth of field to isolate individual directors even when they are seated close together. What this lens allows is corporate photography that is much more interesting and elegant. It offers new solutions to photoshoots, and in the hands of a pro, makes the images for websites and annual reports more attention-grabbing and able to stand out from the crowd. Of course not every shoot requires available light or shallow depth of field. In normal shooting conditions when used with studio lighting, its colour rendering is unsurpassed. 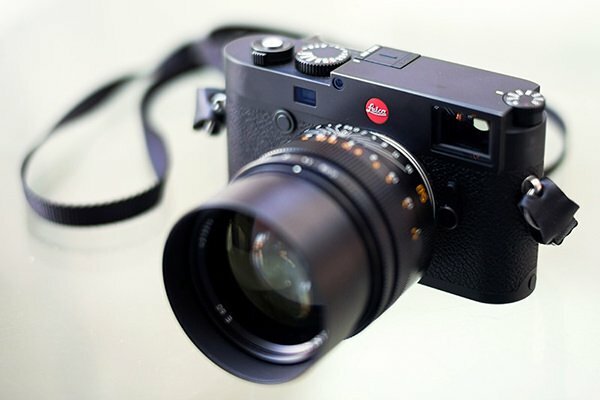 Unlike other lens makers, Leica do not rate ‘sharpness’ as the sole criteria for a lens’s construction and design. For example, the lens is designed to give skin tones a tactile realism, in addition, colour, contrast and even the out of focus areas are extremely important to the overall way an image looks. This applies to all lenses in the Leica range; they are incredible quality and built to last a lifetime. But it’s just as well given the price tags. As a busy corporate photographer who works nearly every day there is precious little time to swap notes with other professional photographers if I want to extend my skills. But I always want to learn new tricks and cover new ground. Like most creative people, I never want to be stuck in a rut. Which led me to plunging myself firmly in the deep end spending a day devoted to street photography. Street photography is the very opposite of my usual studio and location work. It requires working in a completely different way, putting me in the somewhat scary position of not being able to rigorously control lighting, poses and sets. Through The Photographers Gallery in central London I signed up for a day’s session all about street photography with Matt Stuart. 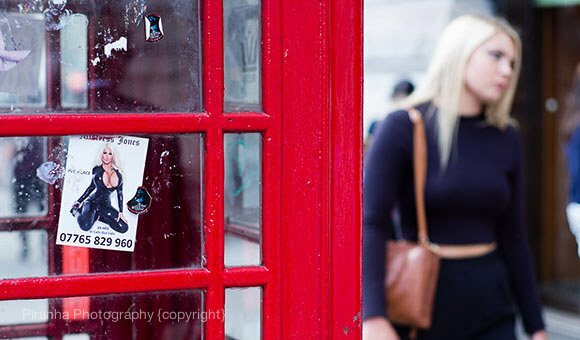 Matt’s a very well-known street photographer who has achieved great success by taking images that capture the quirky and humorous side of London life. It’s down to his skill and often enormous patience that his striking pictures are published around the world. I have been shooting with Leica film rangefinder cameras since the early 90s and have a good set of lenses. But now the digital Leicas have come of age, today these are my equipment of choice for an increasing number of shoots. What’s so good about them? First, their build quality makes Rolex watches look flimsy! The lenses are called ‘brass and glass’ with justification, because that’s all they are made of and they are the sharpest lenses on the market in a compact, virtually indestructible, format. The camera body too is unusual. Its design means little of the photographer’s face is covered when shooting (unlike an SLR) which is far less intimidating to the subject. Consequently, I can get much closer for better shots that will be sharper and with truer colours compared to the much larger SLR versions. The Leica M has been the camera of choice for street work for years. I digress, however. Under Matt’s guidance, I tried my hand at two types of street photography. The first involves being in one place and waiting for something special to happen within camera frame. The second is to walk the streets, spot a likely character and then follow them for a short while to get the best frame from a series of shots. Sounds easy? It isn’t. No one expects a stranger to take their picture when walking down Oxford Street. It takes a bit of guts to snap people you don’t know from close range. The best way is to shoot quickly, smile and move on. Once I found my mojo, I could start taking pictures more spontaneously, producing, dare I say it, results that were fresh and eye catching. I realised the trick is to never put your camera down, or away from your eye, because it requires an enormous act of will to raise it again and continue shooting under such circumstances. After shooting in the Oxford Street area for a couple of hours, we had to choose which images for Matt to review and critique. With lots of other professional photographers also learning street photography it was great to hear everyone’s feedback and to meet new people, and I’d happily repeat the session because I am sure every time will present new challenges. Times change, and technologies improve at an exponential rate, the latest example of this in the photographic world is the Sony A7II mirrorless SLR. Sporting the latest 24megapixel sensor and 5 axis stabilisation on the new Sony/Zeiss lenses. There is great news too if, like me, you have a line up of expensive but older Leica M lenses, 3 axis stabilisation on ANY lens..Which means crisper, sharper images, with great colour depth at virtually any shutter speed. We took delivery here of this new slimline camera, an adapter for the Leica M lenses, put on the Leica 35mm F2 Summicron (one of the sharpest lenses ever made) tossed the manual to one side of course and started shooting. Well I was very pleasantly surprised to see how easy it was to focus with an older lens with this new hi-tech camera, the clarity and detail is phenomenal – the images have a 3D quality about them, such is the legendary nature of Leica glass.